Despite a growing awareness of the long list of benefits that trails can provide to communities, many trails in Chicagoland continue to be poorly maintained and difficult to access with too many dangerous crossings at busy streets. A new plan from the Active Transportation Alliance highlights ways residents and officials can work together to overcome these obstacles and build a regional trail network that works for everyone in Northeast Illinois. 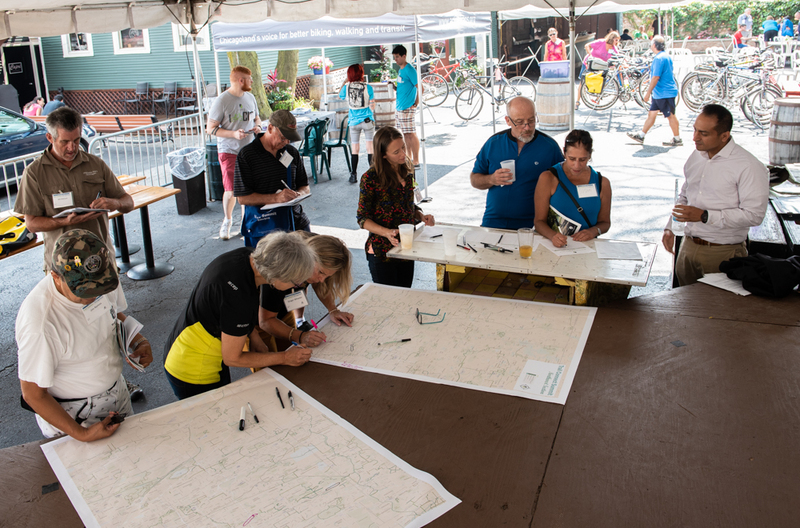 To showcase this new vision for improving trails throughout the region, we recently held our first annual Trail Connect Chicagoland Summer Summit (see photo). The event turned out dozens of local trail advocates and some of the region’s most proactive elected officials who wanted to learn about the plan and share ideas about how to build a better regional trail network (read recent coverage of the unveiling of our campaign and vision in the Daily Herald). Trails provide community residents with an inexpensive, low-stress transportation option. They contribute to a cleaner environment, improved public health and local economic development. In each of these areas Active Trans is working with local advocates and elected officials to develop plans and push projects through to construction. Trail Connect Chicagoland also helps connect supportive elected officials and agencies by building intergovernmental coalitions where leaders can develop regional plans, share funding and construction challenges, discuss best practices and connect with local advocates. If you’re interested in learning more about the newly-released vision plan or getting involved in the Trail Connect Chicagoland campaign, please contact Matt Gomez at matt@activetrans.org or 312-216-0474. You can also sign up to receive updates. For a quick overview of the vision plan, read the executive summary.